Jakarta, Indonesia – When Robertus Robet, a human rights activist, joined the student protests to topple Indonesian dictator Soeharto nearly 30 years ago, he sang a song criticising the military without getting into trouble. Earlier this year, Robet sang the song again to show his opposition to President Joko Widodo‘s decision to allow active military officers to take jobs in government ministries. He was duly arrested. The Indonesian military, commonly known by the acronym TNI (Tentara Nasional Indonesia), was forced to reform after the fall of Soeharto, losing the seats it held in the national parliament during the authoritarian’s 32 years in power. It also had to give up its dual role – to defend the country, but also to enmesh itself in political life across the archipelago. Banned formally from politics since 2004, neither the soldiers nor the police are allowed to vote. But even with the legal restrictions, the generals remain a powerful force. Joko Widodo, the former mayor of Solo who became president in 2014, was the first Indonesian leader to come from outside the traditional elite. While he pitched himself as a democrat reformist, he has come increasingly close to the military. “He has built up a personal network of trusted officers who had worked with him since early in his political career,” Antonius Made Tony Supriatma, a visiting fellow in the Indonesian Studies Programme at the ISEAS-Yusof Ishak Institute in Singapore, wrote in a paper. Two of Widodo’s most-trusted advisers are former generals. Luhut Binsar Panjaitan served in the country’s special forces for more than 20 years, while AM Hendropriyono was also in the special forces and headed the intelligence agency in 2004 when Indonesia’s most prominent human rights activist Munir was killed. The administration of Widodo’s predecessor said Hendropriyono had no connection with the death of Munir, who was poisoned with arsenic on a flight to Europe. Both men’s sons-in-law have also enjoyed a rapid rise up the ranks during Widodo’s time in office. The president also appointed former Army Chief Wiranto to his administration in 2016, giving him the job of Coordinating Political, Legal and Security Minister. Wiranto was indicted by the United Nations for “crimes against humanity” relating to more than 1,000 deaths during East Timor’s bloody 1999 independence vote. He has denied wrongdoing. Try Sutrisno, meanwhile, who was Soeharto’s vice president and was also accused of abuses in East Timor, has endorsed Widodo for a second term. “Our society is stumbling when it comes to spelling out the narrative of civilian and military,” said Puri Kencana Putri, a human rights activist who works on military and human rights issues. Over the past few years, Widodo has sought to address the surplus of middle and senior officers caused by the abolition of that dual function. In 2017, about 141 TNI generals and 790 TNI colonels – each representing about a fifth of the total – had no formal position, according to Supriatma. The proposal to allow 60 to take up jobs in the civilian administration without having to retire, as well as the creation of new units and commands, is part of an effort to address the imbalance. But Evan Laksmana, a senior researcher with the Centre for Strategic and International Studies in Jakarta, said the proposal is merely a stop-gap that does not resolve the problem of officer promotional logjams. “It is a regressive public and military policy,” he said. The military has also been getting more involved with the country’s development, in the kind of national infrastructure initiatives and village-based projects that were a hallmark of the Soeharto era. In its 2018 annual report, the Agrarian Reform Consortium, an NGO, said 41 people were killed, 51 shot and 546 tortured as a result of conflicts over land during Widodo’s first term. The report also claimed that the military and police were working with the government and companies. In Nduga, West Papua, thousands have been forced to flee amid a military offensive that followed last December’s massacre of construction workers by independence fighters. NGOs on the ground accuse the military of harassing local villagers and destroying houses and churches. The TNI spokesman in Papua earlier this month described the allegations as “hoax” and said its troops were committed to upholding the Geneva Conventions. “He [Widodo] failed to make the military more professional,” said Puri. 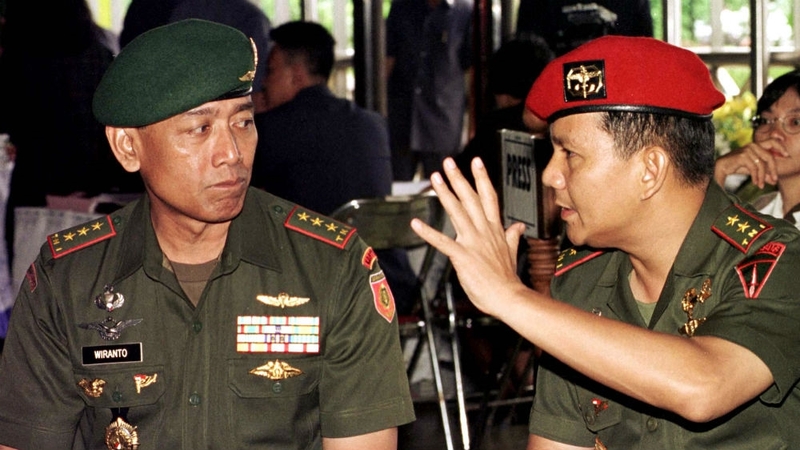 Widodo’s challenger in the April 17 poll, Prabowo Subianto, is also a former general, implicated in the abduction of pro-democracy activists in May 1998. Prabowo was a loyalist of Soeharto and former commander of the Army Strategic Command (Kostrad) and has built a campaign based on nationalism and conservatism, aligning himself with Islamic political parties including the Prosperous Justice Party and the National Mandate Party (PAN). PAN is linked to Muhammadiyah, Indonesia’s second-largest Muslim organisation. Prabowo hopes to capitalise on recent surveys, including Charta Politika and Lembaga Survei Indonesia (LSI), that suggest Indonesians now see the TNI is the most trusted institution in the country. Nevertheless, some people are sceptical. “The younger generation have begun to care about military history in Indonesia and the impact on their everyday life,” said Nisrina Nadhifah Rahman, who works with The Commission for Missing Persons and Victims of Violence (Kontras). Robet’s arrest triggered a public outcry. He was charged with online criminal defamation and for insulting an authority or a public institution. Amnesty International Indonesia’s Executive Director Usman Hamid said the charges were a “blatant” attempt to silence criticism. “[Robet] is an academic who is guilty of nothing more than voicing his views over proposals to place senior military officers in positions of power within the government,” said Usman. 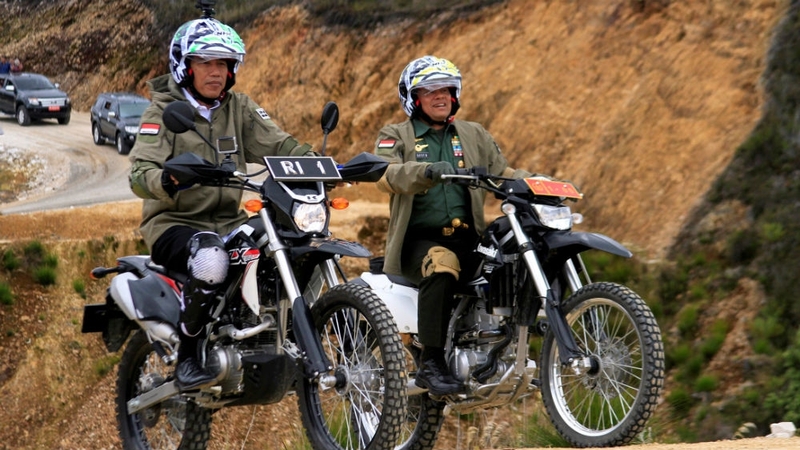 “Jokowi is [the leader] of a civilian government,” said Robet. “He must not sacrifice civilian supremacy only for the pragmatic interests of the election. The storm will move onto the East Coast on Friday.